Subcutaneous specific immunotherapy (SCIT) is an effective treatment attenuatingthe progression of allergic asthma. To date, there is a lack of studiesinvestigating the economic consequences of SCIT on health care expenditures. A health-economic piggy-back analysis of SCIT was conducted based on a RCT thatenrolled 65 children and adolescents with allergic asthma. Patients were allocatedinto two groups: A group receiving SCIT with a high-dose hypoallergenic house dustmite preparation plus asthma medication and a control group receiving only asthmamedication. For both groups asthma control was achieved before the start of theSCIT treatment and was maintained during the study. Both, costs andcost-effectiveness of SCIT with the high-dose hypoallergenic house dust mitepreparation were investigated based on total medication costs, incrementalmedication costs and treatment effects (measured as lung function), respectively.A bootstrap analysis was performed to validate the results. A steady decline in medication costs could be observed in the SCIT group one yearafter treatment start compared to the control group. This cost trend becamestatistically significant 3 years after SCIT started. The calculated potentialsavings in the SCIT group correlated with an improved lung function. Thedistribution of the bootstrap results revealed that the probability of SCIT havinga superior effectiveness compared to the control group is around 90%. SCIT with a high-dose hypoallergenic preparation received by children andadolescents suffering from mite induced allergic asthma reduces the allergicmedication intake and has cost-saving effects. Additional costs associated withSCIT may be completely compensated by drug cost savings 4 years after end of SCIT.Additionally, SCIT is superior compared to routine care as measured by the lungfunction that improved in SCIT-treated patients. Trial registration: (EudraCT no.2004 – 003892 – 35). Asthma is one of the most frequent chronic diseases, with about 300 million patientsbeing affected worldwide . In children, asthma is even the most frequent chronic disease . Considering the age-specific prevalence of asthma, it becomes apparent thatthe asthma prevalence peaks in early childhood and then declines steadily. The GermanKIGGS study reported the lifetime prevalence of asthma in children and adolescents to be4.7% . However, this number might overestimate the prevalence, as the answers werederived from self-responses. Quality of life is reduced in children and adolescentssuffering from asthma . The patients often have a limited ability to participate in physicalactivities and are not able to sleep through the night . Asthma therefore poses a significant burden of disease for the affectedpatients. The annual mean sick leave days in employed asthma patients are around 23 days . In Germany the total direct costs of asthma were measured to be about 2.35billion euro; the costs for sick leave days caused by asthma were estimated to be 242million euro for the year 2006 . This demonstrates that asthma is an important economic factor for the healthsystem. Unlike common antiallergic drugs specific immunotherapy (SIT) is the only treatment forallergic patients that treats the cause of the disease . A specific type of this therapy is the subcutaneous immunotherapy (SCIT).Here, allergen extracts are injected subcutaneously . Allergen-specific subcutaneous immunotherapy (SCIT) is a well-establishedtreatment for mild to moderate asthma. A Cochrane review demonstrated that SCIT is aneffective treatment for reducing asthma symptoms as well as medication use . With the decrease in medication use, we hypothesized that the costs inSCIT-treated children should decrease as well. To our knowledge the cost-effectiveness of SCIT to date in Germany has primarily beendemonstrated in model-based approaches [11, 12], as opposed to actual patient data. This paper therefore aims to analyse theeconomic consequences on medication use and the cost-effectiveness of SCIT in childrenand adolescents with asthma using data from a randomized controlled trial. The present health economic piggy back analysis was conducted based on a randomized,controlled multicenter study (EudraCT-Nr. 2004 – 003892 – 35) includingchildren and adolescents suffering from allergic asthma (GINA levels II and III).Before randomization patients’ minimal requirement for the inhaledcorticosteroid (ICS) dose to achieve asthma control was determined in the baselinephase from September 2005 to February 2006 which represents the time of the highestexposure to house dust mites. Data from patient diaries during the baseline yearbuild a sound and reliable basis of an individual patient status prior to the startof treatment. After achieving asthma control, patients were randomized into anintervention group, receiving a subcutaneous specific immunotherapy with house dustmite allergoid Acaroid® in addition to standard asthma medication, or into acontrol group with standard asthma medication alone. The patients were comparedduring a mean follow up period of 3 years. The study including the present healtheconomic analysis, was approved by an ethics committee in accordance to the ethicalprinciples that have their origin in the Declaration of Helsinki, and that areconsistent with GCP and the applicable regulatory requirements. The primary endpoint of the study was the change in the ICS dose steps required toachieve asthma control (according to GINA ) in children treated for two years with SCIT compared with children on ICSalone. The ICS dosages in both groups during the third treatment year were describedelsewhere . For details on inclusion and exclusion criteria and detailed statisticalmethods see the publication of Zielen et al. 2010 . The economic evaluation was performed using a longitudinal drug cost-analysis, abreak even analysis and a cost-effectiveness analysis. During the study, patients were asked to keep a diary about their total medicationuse (allergic medication as well as other drugs) and to give information whether amedication intake was associated with their allergic suffering or whether it wasrelated to other non-allergic diseases. The drug consumption was monetarily valued intwo ways : If it was applicable to extract the exact quantity of drug intake frompatients diaries, the monetarily valuation was calculated using quantity-based prices(e.g. price per milligram) of the German Rote Liste 2011 . If patients documentation on the quantity of the active ingredients wasinsufficient, we used official DDD-prices (defined daily dose) provided annually bythe German Drug-Prescription report . Unfortunately, further resource consumption, such as outpatient stays orhospitalizations, could not be included in the analysis. Next, the costs for SCITwith Acaroid® were considered, and an expected break even-point was calculated.Therefore, we assumed that potential cost savings, realizable for SCIT patients inthe third treatment year, would be stable over time after the study. Additionally, wedecided to discount the modelled future savings after the third treatment year usinga discount rate of 3% to consider a longer time horizon. The underlying SCIT costsper patient treated with Acaroid® in 2012 were assumed to be about 1,597 euroover the 3-years intervention period (perennial therapy, maintenance therapy every 6weeks, net prices including 19% value added tax, 16% manufacturer sales discount anda price level of August 1, 2009 due to legal price stop). The effectiveness measure for the following health economic cost-effectivenessanalysis was the lung function, expressed as the mean annual morning peak flow (inl/min) after SCIT onset. 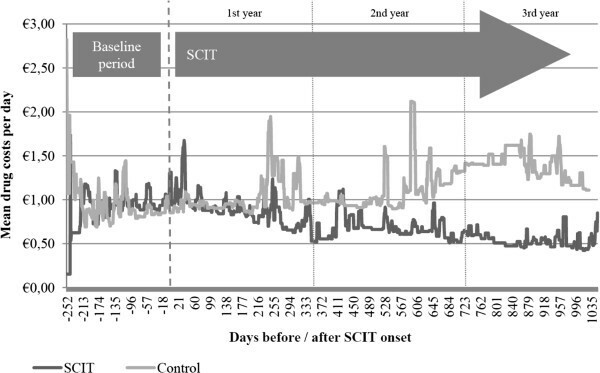 For cost-effectiveness analysis we hence calculated the meanannual morning peak flow during the 3 years after SCIT began in relation to the meanannual total costs (including SCIT costs) associated with treatment arms. To get ameasure of uncertainty we used non-parametric bootstrapping . Therefore, the original sample was bootstrapped 1,000 times to obtain1,000 means for cost and effect differences that were subsequently plotted in acost-effectiveness plane. Socioeconomic data at baseline were analysed using Student’s t-test forcomparing continuous variables and Chi-Square test for dichotomous variables. Drugcosts in both groups were analysed using Mann–Whitney-U test. Forcost-effectiveness analysis, an analysis of covariance (ANCOVA) was conducted toadjust all values of costs and effects for age and the respective peak flow baselinevalue. The significance level was defined to be 5% (two-sided). For inferentialstatistics, we used SPSS© version 20. Finally, we used MS Excel© 2007 tomodel bootstrapped cost-effectiveness analyses. A total of 65 patients were initially recruited and randomized into two groups (33SCIT, 32 controls). The mean age of these patients was 10.0±SD 3.1 years in theSCIT group and 10.6±SD 2, 9 years in the control group. In both groups, about30% of patients were female. We found no significant differences in the averageseverity of asthma (GINA) or the peak flow measurements before the SCIT. Differences,however, were detectable with regard to the allergic-drug costs (434 euro per yearfor SCIT, 296 euro per year in controls, p = 0.130) as well as the resulting totaldrug costs before the SCIT intervention started (485 euro per year for SCIT, 345 europer year in controls, p = 0.083). These differences were due to the fact that beforethe intervention started a total of 6 patients (5 SCIT, 1 control) were identified asoutliers with calculated annual total drug costs of more than 1,000 euro per year.These patients were excluded from the following analyses (see Figure 1). The important baseline characteristics before and afteroutlier exclusion are presented more detailed in Table 1. Total baseline drug costs per year and outlier analysis (each dot representsone patient). The descriptive longitudinal total drug cost analysis (see Figure 2) shows a comparable cost trend in the first year after SCIT wasstarted. During the further course of time an increasing cost difference trend wasobservable favouring patients in the SCIT group. The total drug costs (seeTable 2) reach a significant difference in year 3 afterthe intervention began (193 euro 95% CI [114 to 273] for SCIT, 498 euro 95% CI [293to 702] for controls, p=0.001). This decreasing course of total drug costs forSCIT-patients was mainly driven by a decrease in costs of allergic medication intake.A significant group difference was already reached after the second treatment year.Expectedly, no intervention effect was detectable with regard to non-allergic drugcosts. Course of total drug costs during the study on daily basis (descriptive)– not involving SCIT intervention costs. The results of the drug cost analysis indicate cost savings for patients treated withAcaroid®. If these potential drug cost-savings will be extrapolated for a longertime horizon, as it was described in the methods section, the additional costs of1,597 euro over the 3-years intervention period that are necessary for realizingSCIT, will be expected to be compensated by the drug costs savings about 7 yearsafter SCIT onset or 4 years after the end of triannual SCIT (see Figure 3). 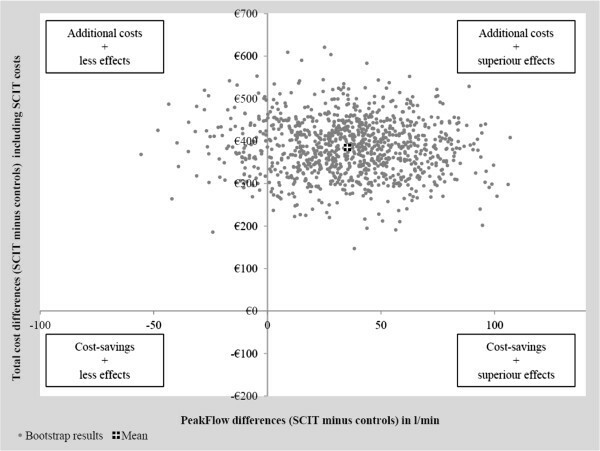 For cost-effectiveness measurement, the SCIT costs were additionally included and theresulting total costs were evaluated in relation to the observable treatment effects.After consideration of SCIT costs, the adjusted total mean costs per patient over the3 years treatment duration differed significantly between the groups (770 euro 95% CI[701 to 839] for SCIT, 383 euro 95% CI [317 to 449] for controls, p<0.001). On theother hand, the use of SCIT with Acaroid® seems to be associated with superioreffectiveness, measured by changes in peak flow results. The mean annual adjustedmorning peak flow over the 3 years of SCIT intervention shows higher values forpatients receiving SCIT (369 l/min 95% CI [354 to 385] for SCIT, 334 l/min 95% CI[319 to 348] for controls, p=0.001). The bootstrapped cost-effectiveness results areshown in Figure 4. Most of the dots (900 of 1,000) arelocated in the upper right hand quadrant of the cost-effectiveness plane, indicatingthat SCIT is associated with additional costs over the 3-years treatment period, butalso with better effectiveness. The probability, that SCIT leads to superioreffectiveness compared to controls can be directly derived from thecost-effectiveness plane and is about 90%. 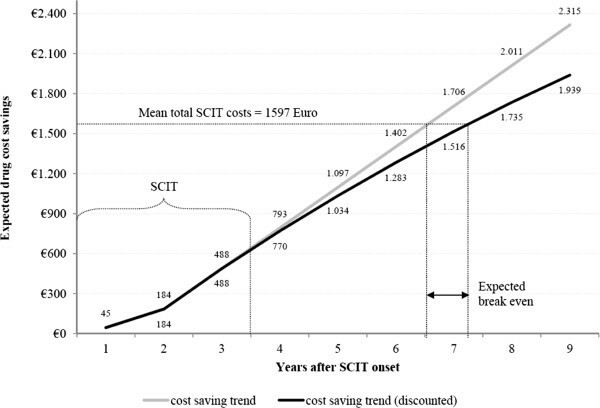 Cost-effectiveness results including SCIT costs. The present investigation indicates SCIT with Acaroid® as a treatment option forchildren and adolescents suffering from allergic asthma. Thus, allergic medicationintake and related drug costs can be reduced, and asthma symptoms improved. After SCITonset, a cost reduction trend was observable, showing that allergic medication costsdecrease from year to year. With regard to SCIT intervention costs, the present analysisindicates, that these costs will be completely compensated by drug cost savings about 7years after SCIT began resp. 4 years after the end of triannual SCIT. An important strength of the present analysis is its embedding in a randomizedcontrolled trial, thus reducing the risk for selection bias and increasing the internalvalidity . As yet, there is a lack of comparable studies on allergic treatmentstrategies that focus on economic consequences especially in children. A study,published by us in 2008, investigated the economic effects of SCIT using aMarkov-model-based approach in age-stratified patients suffering from allergic rhinitisand allergic asthma, and reached similar conclusions . In that study, we calculated a possible break even 10 years postintervention from a society’s perspective. An important point of discussion in the present analysis is the coverage of costs thatcould be included for economic assessment. Since the health economic analysis was notinitially considered in the planning of the study design, we were not able to getretrospective information on resource consumption outside the medication use. It couldbe that besides the drug costs savings we detected in the present analysis, furthercosts will be caused in further health care areas. On the other hand, it seems alsoplausible, that a reduced need for allergic medication will have a positive effect onother medical claims. To get clearness on other cost effects, it would be desirable toanchorage health economic questions during the planning phase of future studies. In the present study asthma in all children had to be controlled and the studypreparation (Acaroid®) helped to maintain this asthma control. Therefore noemergency visits were observed during the study. Consistently very poorly controlledasthma increases the risk for future severe asthma exacerbations [20, 21] and it is well described in literature that patients with uncontrolled asthmahave a higher risk for emergency visits [22–24]. Emergency visits are associated with higher total and asthma-related healthcare costs compared to patients without exacerbations . Our calculation therefore might be considered as very conservative takingonly medication costs into account. Our bootstrapped cost effectiveness results showed that a mean increase of 35 L/min inmorning peak flow ( 10% of total peak flow) in SCIT-treated children can beachieved for additional annual costs of about 385 euro. This better peak flow iscombined with a fluticasone propionate reduction for asthma control. This is ofimportance because the use of inhaled corticosteroids in children is often seencritical. In a recent study by Kelly et al. it was shown that the corticosteroid-induced growth retardation inprepubertal children persisted in adulthood although it was not progressive orcumulative. The anti-inflammatory effect of the allergoid preparation demonstrated by anincreased lung function is comparable to the effect of inhaled corticosteroids used forasthma control . For break even calculation we assumed the cost savings observed in year 3 to be stableover the following years. This could be criticized as the limited study duration of 3years did not allow proving this assumption. Yet, a longer treatment effect is notunlikely. For instance, a systematic review published in 2011 found some evidence forbeneficial long-term effects of SCIT in allergic children after SCIT termination . Due to the adjusting for differential timing of costs, using a mean annualdiscounting-rate of 3% after the third year, the future cost savings were valued lowerthan the present. Although the process of discounting is basically accepted in healtheconomic research  it is consistently a subject of discussion, particularly for long-term healthcare programs where benefits mainly appear in the future . Another limitation could arise from the way we measured the SCIT’scost-effectiveness. This calculation focused only on the 3 years study duration. Duringthat time, the SCIT took place and caused additional intervention costs while futurepotential cost savings after year 3 were ignored. Considering a longer time horizonwould lead to less additional costs for SCIT and would improve the intervention’scost-effectiveness. SCIT with a hypoallergenic high-dose mite preparation received by children andadolescents suffering from mite-allergic asthma reduces the anti-allergic medicationintake of ICS and has cost-saving effects. Additional costs associated with SCIT may becompletely compensated by drug cost savings 4 years after the end of triannual SCIT.Additional SCIT is superior compared to only routine care and leads to an improved lungfunction while asthma control is maintained. The study was financially supported by ALLERGOPHARMA GmbH & Co. KG, Germany. Thedesign and implementation of the analysis was solely the responsibility of theauthors. TR: substantial contributions to conception and design of, or acquisition of data oranalysis and interpretation of data, drafting the article or revising it critically forimportant intellectual content. JKO: drafting the article and revising it critically forimportant intellectual content. STO: substantial contributions to the discussion,revising the manuscript critically for important intellectual content. BB: finalapproval of the version to be published. All authors read and approved the finalmanuscript.